Every year, the National Dairy Shrine (NDS) honors the individuals that have helped to pioneer the industry. Charles “Pete” Knigge of Omro, Wisconsin is among this year’s winners. 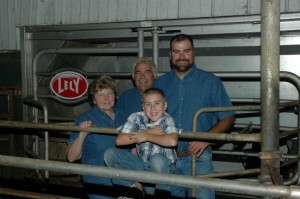 Knigge Farms was the first robotic milking farm in the United States. The facility was an early adaptor of freestall housing and TRM feeding. Knigge has also served a leadership role in numerous state and local dairy and civic organizations. The Knigge family farms 600 acres of alfalfa, corn, soybeans, oats and wheat; milks 130 cows, and raises 170 heifers, calves and steers. Check out this video to hear more about their experience with robotic milking. The National Dairy Shrine Awards are designed to honor past, present and future dairy industry leaders that have contributed to strengthening and energizing the dairy industry. A banquet will be held on Thursday, October 2nd in Madison, Wisconsin during World Dairy Expo to honor all of this year’s recipients. You can check out all of the National Dairy Shrine winners here.